I have frequently been asked which software to use to process astronomical photos. The simple answer is it depends on your imaging system, equipment (with or without a telescope), your camera or video, what you are photographing (Lunar, planets or “DeepSky”), and output image format. Taking photographs of the Moon, Planets, the Milky Way and “DeepSky Objects” of star cluster, nebula and external galaxies is a challenging prospect. Many of the beautiful photos seen online and in magazines are composed of many individual images “stacked” together and many hours processing afterwards to produce the final published photo. Some celestial objects will take very little effort to capture than others; such as our Moon or a single shot image of a bright planet using a telescope, a good focus image can be improved with a little post processing with software that came with your DSLR or Adobe PhotoShop. You may have to look at each photo taken of the Moon to find “the one” that is sharpest focus. Equipment, imaging using a camera or video, telescope, eyepieces and filters all factor into the process. Depending upon the subject photographed can also determine the post processing software to use. Processing software for lunar and planetary, may not be suitable for deep sky. Each software may support only certain formats. For example, TIFF and JPG but not RAW. Some software will only process FITS file format. What software you need to process depend on your digital output format, the telescope, and camera used. There’s many good software to choose from. To try to narrow which to fits your setup better I’ve made a list of which software that works with a file format and the object image. These are the most popular used software. NOTE: these are for the Windows operating system. Beginning with the April 2017 a Lunar Observing program will be presented at the Regular monthly meeting of the club. The first will be a overview of the moon and the variety of lunar features that can be seen on the Moon with a telescope. Lunar features visible beginning 2 days after New Moon ,and forward thru the lunar cycle, will be presented throughout the year. Listed here are the descriptions of craters, Dorsa, Mare, domes, mountains, valleys and rilles in the PowerPoint presentations. Following are the lunar features in the PowerPoint presentations by Lunar Day. 2 smaller craters on floor. Northern wall intrude by 2 craters. Narrow rile running north of center. Linear rille running 18 miles branching into two. Smooth north floor, rougher in south. Straight wide rima, running SW to a deep trench. Extensive terracing and deep groves. Dark floor in the center surrounded by a floor of sandblasted appearance. Narrow 43 mile rima, NW to SE. Longest crater chain on the nearside. Rims have a very sharp look. Fracture, rough floor with narrow sinuous rilles. Radial groves on outer rim and floor. Cluster of small hills in center. Sharp rims with interior terraces. Smooth floor with large secondary crater in the south. Small bright sharp rim crater. Very broad bright fan shaped rays that border Palus Somni, a light gray hilly terrain. Sharp rims and terraced wall. Large size ejecta brake outside rim. Two or three central peaks. Set of three linear rills, look like cat scratches. Braided rope of ridges, some 9 miles wide. A fault changing to a rille. Two domes below Rupes Cauchy. A is deep circular bowl with a raised lip. Under high Sun can be see two long linear parallel rays. Forming a bay on Mare Nectaris. Bowl shaped, crater inside west of center. Linear rilles on east floor. Curving ridge on east wall. Group of 4590 ft. peaks form central mound. A ridge along the east wall. Smooth light color floor in the east. Submerged crater on the south floor. Mountain ridges with the north floor that connect to Cyrillus. Giant fault cuts a path of 496 miles. Eastern drop is 74 miles below the scarp rim. Cluster of 6561 mile high central peaks. Inconspicuous feature outlined by wrinkle ridges. Very impressive broad terraced wall. Complex crater with exterior radial ejecta blanket. A graben, rift valley, 11 miles at it widest point. Steep walls up to 6561 ft. Smooth floor, darker than surrounding mountains. Terrace walled with complex interior. Smooth floor in the west. Grouping of four small central peaks. Very small sinuous rille in the center. Aristillus (34 miles) rim 10,824 ft. Substantial outer radial ejecta blanket. Collection of central mountain peaks in center. Archimedes (50 miles) rim 6232 ft.
Flat flooded floor, light rays deposited on floor. Central peak is covered by flooded floor. Autolycus (24 miles) rim 11,250 ft.
Small crater with outer radial ejecta blanket. Complex floor of extruded lava. Of the 300 peaks the highest measured peak is over 18,000 ft.
Complex crater with broad inner walls. Central peak, 487 ft., is west of center. SW wall intruded by 27 mile crater Klien. Western wall rough and disorientated. NE hilly with small craters. Ptolemaeus (101 miles) rim 7872 ft.
Circular Plain, Striated walls, Flooded floor. Six mille crater on floor in NE corner. Alphonsus (73 miles) rim 8954 ft.
Solitary central peak 9840 ft in height. Small rilles around edge of floor. Arzachel (59 miles) rim 12.496 ft. Inner walls have a intricate terracing. Narrow rima, Rima Arzachel, parallel to east wall. Central peak, 4900 ft. high, is offset to west from center. that rises up to 2170 feet above crater floor. of the different lava flows. A graben – elongated depression between two parallel faults. Ground between has fallen away. to crater Hyginus, itself may be a rimless pit. Each ends are smaller rilles. A classic fault in east edge of Mare Nubium. It is a 7 degree slope, at a height of 800 feet. Very prominent Dark floor crater. The floor is 6561 feet below rim. Shadows cast by rim onto the floor is a spectacular sight. Without a central mountain peak. Has a 3.7 mile crater in middle of floor. Complex crater with sharp rim and wide internal terraced walls. Floor shows impact sculpting surrounding the 3 mountain peaks. Outside is a thick ejecta blanket. Young crater with impressive radial ray. Secondary impacts from excavation of crater. Complicated terraced walls and internal landslides. Floor is 12,464 feet below rim. Two major mountain massive peaks. Smooth floor containing small hills instead of a mountain massif peaks. Very prominent crater with an indent on the SE wall. Eroded crater with complex rills system on flat floor. Has the largest and complex system of rays. Impressive sharp rim terraced walls. Interior floor filled pool of impact melt. Large pair of mountain massif peaks. Dark collar of impact melt outside of the rim. Large flat floor crater with a scalloped rim. Heavily cratered floor with a distinct small arc of unconnected craters. Milichius dome – an isolated 3 mile diameter dome with a central pit. Hortensius domes – Six dome cluster field, 1 to 3 miles in size, with central pits. Southern half of the rim is overrun by lava flow of Mare Imbrium. Second largest dome with a small summit crater. Brightest ray crater on the moon. Impressive sinuous rille, a collapse 3000 ft deep lava tube. Exterior mound shows radial structure. instead of central mountain peak. interacting with rays of Copernicus. Magnificent crater on the North boundary of Mare Humorum. Complex floor containing small hills, mountains, ridges and rilles. Has three of a mountain peaks. Walls are partial submerged by Mare Humorum. Southern is very smooth, north has an prominent central mountain Ridge. May have been formed by 3 or 4 impacts. Low circular walls with around a smooth floor. that a darker patch near the wall rim. rim with extruded lava. Y shaped ridge on center. with a central mountain peak. Sharp rim crater with broad inner terraced walls. Dark inner floor with a small central hill. Bright broad rim and dark interior floor under high sunlight. Large elongated flood crater with sharp rims. North wall all is eroded by lave flow. Shares a eroded wall with crater Struve. Flooded floore is smooth, does not have a central peak. Deep crater with a sharp rim with signs of terraced walls. Eroded wall crater with rilles on the interior floor. Broken hills surround the plain. Well defined low wall crater. Complex interior floor,small rilles and hilly in the south. Large dark patch in the north. Largest crater on the Moon best seen during favorable librations. Low multi ring impact basin. Eroded outer walls, rough crater floor. Numerous mountains around lunar rim near the pole. Very large Multi Ring Impact Basin. In the year 2016 the planet Mars will be at opposition and close to our planet Earth. Listed below are some sites on how to observe the planet Mars and detail information on the 2016 opposition. Software and web sites with information on observing the planet Mars. Links to other sites are found on the ALPO and BBA sites. Yellow (W8) Enhances Martian cloud details. Yellow (W12, W15) to brighten desert regions, darkens bluish and brownish features. Orange (W21, W23A) further increases contrast between light and dark features, penetrates hazes and most clouds, and limited detection of dust clouds. Red (W25, W29) gives maximum contrast of surface features, enhances fine surface details, dust clouds boundaries, and polar cap boundaries. Yellow-green (W57,W11) darkens red and blue features, enhances frost patches, surface fogs, and polar projections. Blue-Green (W64) helps detect ice-fogs and polar hazes. Blue (W80A, W38, W38A) and deep blue (W46, W47) shows atmospheric clouds, discrete white clouds, and limb hazes, equatorial cloud bands, polar cloud hoods, and darkens reddish features. Neutral density	These filters simply darken bright objects and reduce glare for better resolution of details. As a response to all the attention that Jupiter has been receiving in the news, the planet Saturn is now putting on a show of a major storm in the North Temperate Zone. Numerous amateur astronomers have been recording the development of this major outbreak. As a long time observer of Saturn, a white spot this large and bright is a very rare event. Visible features on the globe are usually small and dim, if visible at all. Most are only discovered in photographs. It is well worth your effort to see this current storm, even if you must content with winter conditions and rise up early to observe Saturn in the morning . The following are times when this ever expanding storm can be viewed in the Eastern Time Zone. How long this will be visible is not certain. The white hue storm has spread out in the NTrZ and diminish in brightness. I am using the central Merdian of the major outbreak, more of the storm following it. It has been given a unoffical name as The Serpent Storm by those who view and image it frequently in the Saturn Yahoo Group. As of June 2011 the Storm in the northern hemisphere of Saturn continues to show up in amateur photos. Spreading across nearly the entire longitude there are few places it does not show up. This is a recent photo from TGC Observatory. Althought it was not seen visualy with the RC20 at any magnification. I could see the white belt on the laptop screen using a DFK31AUS camera for imaging. Update CM to 63.6 degrees SYSTEM III, the Head of the Storm, which is the latest information fron images by Efrain Morales Rivera posted on Saturn Yahoo Group on June 17, 2011 . One must be out in the early morning hours on Tuesday morning to see this Total Lunar Eclipse. The full moon will is riding high in the sky during the winter months for northern hemisphere observers. This will be the highest altitude start of an eclipse in a long while. It will start out high and gradually lower as the night wears on. The graph show the position of First Contact. Start now to determine a prime observing spot from your home location to setup your scope to see the event. Make sure there are no trees or building to block the moon. I know I must move a distance to clear some tall pines that will be in the way. 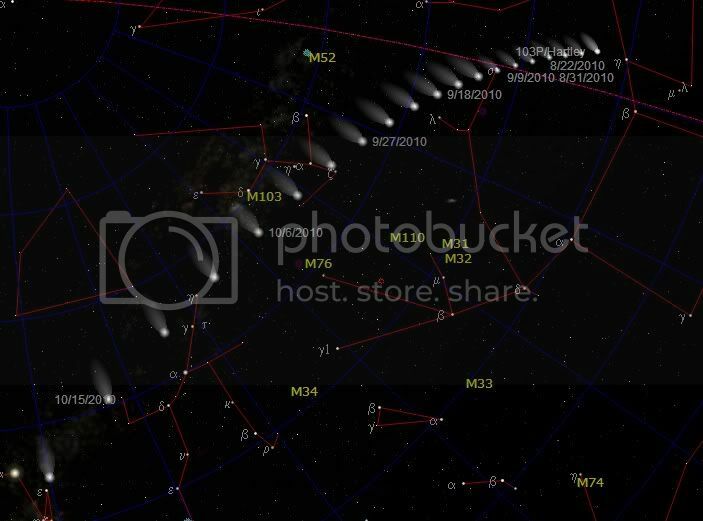 The graphic also shows faint asteroids as red objects, one near the moon. Dress for the weather, and take a few breaks inside to warm up inside your home. If trying photography, insure you have additonal batteries for your camera, and the portable power pack is fully charged to drive the equatorial mount. The next Total Lunar Eclipse that we can see is not until Oct 8, 2014. Which will be settiing during the total phase. The September 28, 2015 will be placed better for us. Winter is here and with it colder nighttime temperatures. Don’t let that stop you looking at Jupiter; it’s in good viewing position as the night sky appears. I did have a fantastic view of Jupiter in the RC20 f/8.1 telescope one evening in October with near perfect seeing. Watch the white oval in the NEBs transit, the GRS and a red barge in the NTB transit later on. The GRS was seen easily with 26 mm and 15 mm eyepieces. A W82A filter gave a more pleasant view, while a deeper blue filter W47 made the GRS stand out on the planet. Even with those filters I could not see the Oval BA following that followed the GRS. A dusty region followed the GRS and was more southern in the STB. No sign the Oval BA was a darker red oval. I did manage to see, only once, a smaller white oval in the SSTB above the dusty region in the STB. Nov 20, 2010 : I’ve kept the White Spot in the SEB, added the SEB Revival Spot, and changed the longitide of Oval BA. The GRS Spot (SYS II = 160) transits at 4:13 U.T. The GRS Spot (SYS II = 160) transits at 14: 8 U.T. The Oval BA (SYS II = 113) in STZ transits at 2:55 U.T. The Oval BA (SYS II = 113) in STZ transits at 12:51 U.T. The Oval BA (SYS II = 113) in STZ transits at 22:46 U.T. The White Oval (SYS II = 84) in NEB transits at 2: 7 U.T. The White Oval (SYS II = 84) in NEB transits at 12: 3 U.T. The White Oval (SYS II = 84) in NEB transits at 21:58 U.T. The SEB Rivival Spot (SYS II = 290) in SEB transits at 7:48 U.T. The SEB Rivival Spot (SYS II = 290) in SEB transits at 17:43 U.T. The GRS Spot (SYS II = 160) transits at 0: 4 U.T. The GRS Spot (SYS II = 160) transits at 10: 0 U.T. The GRS Spot (SYS II = 160) transits at 19:56 U.T. The Oval BA (SYS II = 113) in STZ transits at 8:42 U.T. The Oval BA (SYS II = 113) in STZ transits at 18:38 U.T. The White Oval (SYS II = 84) in NEB transits at 7:54 U.T. The White Oval (SYS II = 84) in NEB transits at 17:50 U.T. The SEB Rivival Spot (SYS II = 290) in SEB transits at 3:39 U.T. The SEB Rivival Spot (SYS II = 290) in SEB transits at 13:35 U.T. The SEB Rivival Spot (SYS II = 290) in SEB transits at 23:31 U.T. The GRS Spot (SYS II = 160) transits at 5:51 U.T. The GRS Spot (SYS II = 160) transits at 15:47 U.T. The Oval BA (SYS II = 113) in STZ transits at 4:33 U.T. The Oval BA (SYS II = 113) in STZ transits at 14:29 U.T. The White Oval (SYS II = 84) in NEB transits at 3:45 U.T. The White Oval (SYS II = 84) in NEB transits at 13:41 U.T. The White Oval (SYS II = 84) in NEB transits at 23:37 U.T. The SEB Rivival Spot (SYS II = 290) in SEB transits at 9:26 U.T. The SEB Rivival Spot (SYS II = 290) in SEB transits at 19:22 U.T. The GRS Spot (SYS II = 160) transits at 1:43 U.T. The GRS Spot (SYS II = 160) transits at 11:39 U.T. The GRS Spot (SYS II = 160) transits at 21:34 U.T. The Oval BA (SYS II = 113) in STZ transits at 0:25 U.T. The Oval BA (SYS II = 113) in STZ transits at 10:21 U.T. The Oval BA (SYS II = 113) in STZ transits at 20:17 U.T. The White Oval (SYS II = 84) in NEB transits at 9:33 U.T. The White Oval (SYS II = 84) in NEB transits at 19:29 U.T. The SEB Rivival Spot (SYS II = 290) in SEB transits at 5:18 U.T. The SEB Rivival Spot (SYS II = 290) in SEB transits at 15:14 U.T. The GRS Spot (SYS II = 160) transits at 7:30 U.T. The GRS Spot (SYS II = 160) transits at 17:26 U.T. The Oval BA (SYS II = 113) in STZ transits at 6:13 U.T. The Oval BA (SYS II = 113) in STZ transits at 16: 8 U.T. The White Oval (SYS II = 84) in NEB transits at 5:25 U.T. The White Oval (SYS II = 84) in NEB transits at 15:20 U.T. The SEB Rivival Spot (SYS II = 290) in SEB transits at 1:10 U.T. The SEB Rivival Spot (SYS II = 290) in SEB transits at 11: 6 U.T. The SEB Rivival Spot (SYS II = 290) in SEB transits at 21: 1 U.T. The GRS Spot (SYS II = 160) transits at 3:22 U.T. The GRS Spot (SYS II = 160) transits at 13:18 U.T. The GRS Spot (SYS II = 160) transits at 23:13 U.T. The Oval BA (SYS II = 113) in STZ transits at 2: 4 U.T. The Oval BA (SYS II = 113) in STZ transits at 12: 0 U.T. The Oval BA (SYS II = 113) in STZ transits at 21:56 U.T. The White Oval (SYS II = 84) in NEB transits at 1:16 U.T. The White Oval (SYS II = 84) in NEB transits at 11:12 U.T. The White Oval (SYS II = 84) in NEB transits at 21: 8 U.T. The SEB Rivival Spot (SYS II = 290) in SEB transits at 6:57 U.T. The SEB Rivival Spot (SYS II = 290) in SEB transits at 16:53 U.T. The GRS Spot (SYS II = 160) transits at 9: 9 U.T. The GRS Spot (SYS II = 160) transits at 19: 4 U.T. The Oval BA (SYS II = 113) in STZ transits at 7:51 U.T. The Oval BA (SYS II = 113) in STZ transits at 17:47 U.T. The White Oval (SYS II = 84) in NEB transits at 7: 3 U.T. The White Oval (SYS II = 84) in NEB transits at 16:59 U.T. The SEB Rivival Spot (SYS II = 290) in SEB transits at 2:48 U.T. The SEB Rivival Spot (SYS II = 290) in SEB transits at 12:44 U.T. The SEB Rivival Spot (SYS II = 290) in SEB transits at 22:39 U.T. The GRS Spot (SYS II = 160) transits at 5: 1 U.T. The GRS Spot (SYS II = 160) transits at 14:57 U.T. The Oval BA (SYS II = 113) in STZ transits at 3:43 U.T. The Oval BA (SYS II = 113) in STZ transits at 13:39 U.T. The Oval BA (SYS II = 113) in STZ transits at 23:34 U.T. The White Oval (SYS II = 84) in NEB transits at 2:55 U.T. The White Oval (SYS II = 84) in NEB transits at 12:51 U.T. The White Oval (SYS II = 84) in NEB transits at 22:46 U.T. The SEB Rivival Spot (SYS II = 290) in SEB transits at 8:36 U.T. The SEB Rivival Spot (SYS II = 290) in SEB transits at 18:32 U.T. The GRS Spot (SYS II = 160) transits at 0:52 U.T. The GRS Spot (SYS II = 160) transits at 10:48 U.T. The GRS Spot (SYS II = 160) transits at 20:44 U.T. The Oval BA (SYS II = 113) in STZ transits at 9:30 U.T. The Oval BA (SYS II = 113) in STZ transits at 19:26 U.T. The White Oval (SYS II = 84) in NEB transits at 8:42 U.T. The White Oval (SYS II = 84) in NEB transits at 18:38 U.T. The SEB Rivival Spot (SYS II = 290) in SEB transits at 4:28 U.T. The SEB Rivival Spot (SYS II = 290) in SEB transits at 14:23 U.T. The GRS Spot (SYS II = 160) transits at 6:40 U.T. The GRS Spot (SYS II = 160) transits at 16:35 U.T. The Oval BA (SYS II = 113) in STZ transits at 5:22 U.T. The Oval BA (SYS II = 113) in STZ transits at 15:18 U.T. The White Oval (SYS II = 84) in NEB transits at 4:34 U.T. The White Oval (SYS II = 84) in NEB transits at 14:30 U.T. The SEB Rivival Spot (SYS II = 290) in SEB transits at 0:19 U.T. The SEB Rivival Spot (SYS II = 290) in SEB transits at 10:15 U.T. The SEB Rivival Spot (SYS II = 290) in SEB transits at 20:11 U.T. The GRS Spot (SYS II = 160) transits at 2:31 U.T. The GRS Spot (SYS II = 160) transits at 12:26 U.T. The GRS Spot (SYS II = 160) transits at 22:22 U.T. The Oval BA (SYS II = 113) in STZ transits at 1:13 U.T. The Oval BA (SYS II = 113) in STZ transits at 11: 9 U.T. The Oval BA (SYS II = 113) in STZ transits at 21: 4 U.T. The White Oval (SYS II = 84) in NEB transits at 0:25 U.T. The White Oval (SYS II = 84) in NEB transits at 10:21 U.T. The White Oval (SYS II = 84) in NEB transits at 20:16 U.T. The SEB Rivival Spot (SYS II = 290) in SEB transits at 6: 6 U.T. The SEB Rivival Spot (SYS II = 290) in SEB transits at 16: 2 U.T. The GRS Spot (SYS II = 160) transits at 8:18 U.T. The GRS Spot (SYS II = 160) transits at 18:14 U.T. The Oval BA (SYS II = 113) in STZ transits at 7: 0 U.T. The Oval BA (SYS II = 113) in STZ transits at 16:56 U.T. The White Oval (SYS II = 84) in NEB transits at 6:12 U.T. The White Oval (SYS II = 84) in NEB transits at 16: 8 U.T. The SEB Rivival Spot (SYS II = 290) in SEB transits at 1:58 U.T. The SEB Rivival Spot (SYS II = 290) in SEB transits at 11:53 U.T. The SEB Rivival Spot (SYS II = 290) in SEB transits at 21:49 U.T. The first two weeks of September 2010 should be a good time to begin a search for comet 103P Hartley. By that time the should be bright enough to see in a modest size telescope. Depending of course that it follows the redicted pattern of increased brightness. Already I have read online that this comet will be visible to the unaided eye when at maximum brightness of 5th magnitude. Let me point out that this depend upon the extend of the size of the coma. A 5th magnitude star is can be difficult enough to see for newbies to astronomy, a diffuse object of 5th magnitude will be more difficult. To brush up on comet observing you can review information on the topic in November Observing post (2009) in this Observing Notes blog. I do expect this comet get some press in newspapers and featured in popular online news outlets for two reasons. It will make a close approach to Earth, some 0.12 A.U., Astronomical Units, roughly 11 million miles (October 20, 2010). The other reason, the spacecraft EPOXI, you know it as the Deep Impact http://deepimpact.umd.edu/ is on it’s way to a encounter this comet in November 2010. That alone will insure some press coverage. Here is a list produced from the software Guide version 8. The positions are for zero hours Universal Time, U.T., from orbital elements at this time. the column labeled “r” is distance from the Sun in A.U. and “delta” from the Earth in A.U. A plot of the comet’s path from TheSky6 follows. More transit times of the GRS on Jupiter. I suspect that the Oval BA will get close to the GRS a pass by it during this viewing season. Keep an watch on this for any changes than may occur to the Oval BA. The GRS Spot (SYS II = 152) transits at 9: 7 U.T. The GRS Spot (SYS II = 152) transits at 19: 2 U.T. The Oval BA (SYS II = 152) in STZ transits at 9: 7 U.T. The Oval BA (SYS II = 152) in STZ transits at 19: 2 U.T. The White Spot (SYS I = 58) in NEBs transits at 13:40 U.T. The White Spot (SYS I = 58) in NEBs transits at 23:30 U.T. The GRS Spot (SYS II = 152) transits at 4:58 U.T. The GRS Spot (SYS II = 152) transits at 14:54 U.T. The Oval BA (SYS II = 152) in STZ transits at 4:58 U.T. The Oval BA (SYS II = 152) in STZ transits at 14:54 U.T. The White Spot (SYS I = 58) in NEBs transits at 09:21 U.T. The White Spot (SYS I = 58) in NEBs transits at 19:11 U.T. The GRS Spot (SYS II = 152) transits at 0:49 U.T. The GRS Spot (SYS II = 152) transits at 10:45 U.T. The GRS Spot (SYS II = 152) transits at 20:41 U.T. The Oval BA (SYS II = 152) in STZ transits at 0:49 U.T. The Oval BA (SYS II = 152) in STZ transits at 10:45 U.T. The Oval BA (SYS II = 152) in STZ transits at 20:41 U.T. The White Spot (SYS I = 58) in NEBs transits at 05:02 U.T. The White Spot (SYS I = 58) in NEBs transits at 14:52 U.T. The GRS Spot (SYS II = 152) transits at 6:36 U.T. The GRS Spot (SYS II = 152) transits at 16:32 U.T. The Oval BA (SYS II = 152) in STZ transits at 6:36 U.T. The Oval BA (SYS II = 152) in STZ transits at 16:32 U.T. The White Spot (SYS I = 58) in NEBs transits at 0:43 U.T. The White Spot (SYS I = 58) in NEBs transits at 10:33 U.T. The White Spot (SYS I = 58) in NEBs transits at 20:23 U.T. The GRS Spot (SYS II = 152) transits at 2:27 U.T. The GRS Spot (SYS II = 152) transits at 12:23 U.T. The GRS Spot (SYS II = 152) transits at 22:19 U.T. The Oval BA (SYS II = 152) in STZ transits at 2:27 U.T. The Oval BA (SYS II = 152) in STZ transits at 12:23 U.T. The Oval BA (SYS II = 152) in STZ transits at 22:19 U.T. The White Spot (SYS I = 58) in NEBs transits at 6:14 U.T. The White Spot (SYS I = 58) in NEBs transits at 16:04 U.T. The GRS Spot (SYS II = 152) transits at 8:14 U.T. The GRS Spot (SYS II = 152) transits at 18:10 U.T. The Oval BA (SYS II = 152) in STZ transits at 8:14 U.T. The Oval BA (SYS II = 152) in STZ transits at 18:10 U.T. The White Spot (SYS I = 58) in NEBs transits at 1:55 U.T. The White Spot (SYS I = 58) in NEBs transits at 11:45 U.T. The White Spot (SYS I = 58) in NEBs transits at 21:35 U.T. The GRS Spot (SYS II = 152) transits at 4: 5 U.T. The GRS Spot (SYS II = 152) transits at 14: 0 U.T. The GRS Spot (SYS II = 152) transits at 23:56 U.T. The Oval BA (SYS II = 152) in STZ transits at 4: 5 U.T. The Oval BA (SYS II = 152) in STZ transits at 14: 0 U.T. The Oval BA (SYS II = 152) in STZ transits at 23:56 U.T. The White Spot (SYS I = 58) in NEBs transits at 7:06 U.T. The White Spot (SYS I = 58) in NEBs transits at 17:16 U.T. The GRS Spot (SYS II = 152) transits at 9:52 U.T. The GRS Spot (SYS II = 152) transits at 19:48 U.T. The Oval BA (SYS II = 152) in STZ transits at 9:52 U.T. The Oval BA (SYS II = 152) in STZ transits at 19:48 U.T. The White Spot (SYS I = 58) in NEBs transits at 3:07 U.T. The White Spot (SYS I = 58) in NEBs transits at 12:57 U.T. The White Spot (SYS I = 58) in NEBs transits at 22:47 U.T. The GRS Spot (SYS II = 152) transits at 5:43 U.T. The GRS Spot (SYS II = 152) transits at 15:39 U.T. The Oval BA (SYS II = 152) in STZ transits at 5:43 U.T. The Oval BA (SYS II = 152) in STZ transits at 15:39 U.T. The White Spot (SYS I = 58) in NEBs transits at 8:38 U.T. The White Spot (SYS I = 58) in NEBs transits at 18:28 U.T. The GRS Spot (SYS II = 152) transits at 1:34 U.T. The GRS Spot (SYS II = 152) transits at 11:30 U.T. The GRS Spot (SYS II = 152) transits at 21:25 U.T. The Oval BA (SYS II = 152) in STZ transits at 1:34 U.T. The Oval BA (SYS II = 152) in STZ transits at 11:30 U.T. The Oval BA (SYS II = 152) in STZ transits at 21:25 U.T. The White Spot (SYS I = 58) in NEBs transits at 4:19 U.T. The White Spot (SYS I = 58) in NEBs transits at 14:09 U.T. The GRS Spot (SYS II = 152) transits at 7:21 U.T. The GRS Spot (SYS II = 152) transits at 17:16 U.T. The Oval BA (SYS II = 152) in STZ transits at 7:21 U.T. The Oval BA (SYS II = 152) in STZ transits at 17:16 U.T. The White Spot (SYS I = 58) in NEBs transits at 0:00 U.T. The White Spot (SYS I = 58) in NEBs transits at 9:50 U.T. The White Spot (SYS I = 58) in NEBs transits at 19:40 U.T. The GRS Spot (SYS II = 152) transits at 3:12 U.T. The GRS Spot (SYS II = 152) transits at 13: 7 U.T. The GRS Spot (SYS II = 152) transits at 23: 3 U.T. The Oval BA (SYS II = 152) in STZ transits at 3:12 U.T. The Oval BA (SYS II = 152) in STZ transits at 13: 7 U.T. The Oval BA (SYS II = 152) in STZ transits at 23: 3 U.T. The White Spot (SYS I = 58) in NEBs transits at 5:31 U.T. The White Spot (SYS I = 58) in NEBs transits at 15:21 U.T. The GRS Spot (SYS II = 152) transits at 8:59 U.T. The GRS Spot (SYS II = 152) transits at 18:55 U.T. The Oval BA (SYS II = 152) in STZ transits at 8:59 U.T. The Oval BA (SYS II = 152) in STZ transits at 18:55 U.T. The White Spot (SYS I = 58) in NEBs transits at 1:12 U.T. The White Spot (SYS I = 58) in NEBs transits at 11:02 U.T. The White Spot (SYS I = 58) in NEBs transits at 20:52 U.T. For observers of the planet Jupiter, who rise early or stay up late, the planet is a prime target in the finder’s crosshair or Telrad circle. This is a good time to see the Great Red Spot, as it stands out alone against a dull white STrZ and SEB region. At this time the usual dark SEB is hidden behind a higher layer of white clouds or haze. When this happens the GRS is a easy target. It may also be possible to see the Oval BA that follows the GRS by some 20 degrees. Here are some Universal dates and time to look for both of these features. The GRS Spot (SYS II = 152) transits at 9:21 U.T. The GRS Spot (SYS II = 152) transits at 19:17 U.T. The Oval BA (SYS II = 165) in STZ transits at 9:43 U.T. The Oval BA (SYS II = 165) in STZ transits at 19:38 U.T. The GRS Spot (SYS II = 152) transits at 5:12 U.T. The GRS Spot (SYS II = 152) transits at 15: 8 U.T. The Oval BA (SYS II = 165) in STZ transits at 5:34 U.T. The Oval BA (SYS II = 165) in STZ transits at 15:29 U.T. The GRS Spot (SYS II = 152) transits at 1: 4 U.T. The GRS Spot (SYS II = 152) transits at 10:59 U.T. The GRS Spot (SYS II = 152) transits at 20:55 U.T. The Oval BA (SYS II = 165) in STZ transits at 1:25 U.T. The Oval BA (SYS II = 165) in STZ transits at 11:21 U.T. The Oval BA (SYS II = 165) in STZ transits at 21:17 U.T. The GRS Spot (SYS II = 152) transits at 6:50 U.T. The GRS Spot (SYS II = 152) transits at 16:46 U.T. The Oval BA (SYS II = 165) in STZ transits at 7:12 U.T. The Oval BA (SYS II = 165) in STZ transits at 17: 8 U.T. The GRS Spot (SYS II = 152) transits at 2:41 U.T. The GRS Spot (SYS II = 152) transits at 12:37 U.T. The GRS Spot (SYS II = 152) transits at 22:33 U.T. The Oval BA (SYS II = 165) in STZ transits at 3: 3 U.T. The Oval BA (SYS II = 165) in STZ transits at 12:59 U.T. The Oval BA (SYS II = 165) in STZ transits at 22:54 U.T. The GRS Spot (SYS II = 152) transits at 8:29 U.T. The GRS Spot (SYS II = 152) transits at 18:24 U.T. The Oval BA (SYS II = 165) in STZ transits at 8:50 U.T. The Oval BA (SYS II = 165) in STZ transits at 18:46 U.T. The GRS Spot (SYS II = 152) transits at 4:20 U.T. The GRS Spot (SYS II = 152) transits at 14:16 U.T. The Oval BA (SYS II = 165) in STZ transits at 4:42 U.T. The Oval BA (SYS II = 165) in STZ transits at 14:37 U.T. The GRS Spot (SYS II = 152) transits at 0:11 U.T. The GRS Spot (SYS II = 152) transits at 10: 7 U.T. The GRS Spot (SYS II = 152) transits at 20: 3 U.T. The Oval BA (SYS II = 165) in STZ transits at 0:33 U.T. The Oval BA (SYS II = 165) in STZ transits at 10:29 U.T. The Oval BA (SYS II = 165) in STZ transits at 20:24 U.T. The GRS Spot (SYS II = 152) transits at 5:58 U.T. The GRS Spot (SYS II = 152) transits at 15:54 U.T. The Oval BA (SYS II = 165) in STZ transits at 6:20 U.T. The Oval BA (SYS II = 165) in STZ transits at 16:15 U.T. The GRS Spot (SYS II = 152) transits at 1:50 U.T. The GRS Spot (SYS II = 152) transits at 11:45 U.T. The GRS Spot (SYS II = 152) transits at 21:41 U.T. The Oval BA (SYS II = 165) in STZ transits at 2:11 U.T. The Oval BA (SYS II = 165) in STZ transits at 12: 7 U.T. The Oval BA (SYS II = 165) in STZ transits at 22: 3 U.T. The GRS Spot (SYS II = 152) transits at 7:36 U.T. The GRS Spot (SYS II = 152) transits at 17:32 U.T. The Oval BA (SYS II = 165) in STZ transits at 7:58 U.T. The Oval BA (SYS II = 165) in STZ transits at 17:54 U.T. The GRS Spot (SYS II = 152) transits at 3:27 U.T. The GRS Spot (SYS II = 152) transits at 13:23 U.T. The GRS Spot (SYS II = 152) transits at 23:19 U.T. The Oval BA (SYS II = 165) in STZ transits at 3:49 U.T. The Oval BA (SYS II = 165) in STZ transits at 13:45 U.T. The Oval BA (SYS II = 165) in STZ transits at 23:40 U.T. The GRS Spot (SYS II = 152) transits at 9:15 U.T. The GRS Spot (SYS II = 152) transits at 19:10 U.T. The Oval BA (SYS II = 165) in STZ transits at 9:36 U.T. The Oval BA (SYS II = 165) in STZ transits at 19:32 U.T. Our Moon, when viewed thru the eyepiece of a telescope shows us a great variety of surface detail. Besides the many craters of all sizes and complexity there are mare, mountains, rilles, and small domes spread across the surface. Under a changing illumination these features take a different view in the eyepiece. Guidebooks and maps are well worth it when locating and identify these named features. Any of the variety of references here will be of great value to assist a Lunar Observer with that task. Not an exhaustive list of all resources, rather a good material to start with. Each resource type is separated into one of six category type. You’ll notice the majority of the resources are Internet available, with the exception of the first two categories. I cannot recall the last time the weather was so good at sunset during April. Our usual rain clouds that prevail mostly during the start of spring weather held back, till the 2nd half of the month. This weather happened at the right time, the planet Mercury was putting on an appearance in the west joining Venus in the same part of the sky. It was good time to show Mercury during the start of the spring public viewing nights at Thomas G. Cupillari Observatory. With Venus serving as a guide, Mercury is easily swept up in the 8 x 50 finder scope on the Clark refractor. Using the local terrain, I aim the refractor to the approximate point in the western sky where Venus makes its appearance. One or two sweeps of the scope and Venus is found in the 8 x 50 finder. Offsetting Venus in the finder and Mercury is seen. Most of the time I can locate Venus between 7:30 and 7:45 PM EDT, when the Sun is on the western horizon. On April 14, 2010 I swept it up at 7:13 PM EDT, using my hand to shade the Sun from my eyes. It was a good telescope view, very steady gibbous disk, better than any of the precious 8 days that I was able to view it in the scope. It took more time to find Mercury. Rarely had I seen Mercury show a good appearance in the low sky, but tonight the crescent phase was holding steady, if only for a little while. The small nine arc second disk was 20% illuminated. Never have I seen it so well, so low in the sky. My camera got a work out in April. Sitting on a tripod I would capture from 75 to 90 photographs a night of Venus and Mercury as they moved closer to the horizon. A record 9 out of 16 days that I was able to photograph both planets together. Usually I would only manage 3 days before weather hampered photographing Mercury. The long string of nice skies and warmer temp is now past it’s time. Now it is back to more normal conditions for this time of year. More times than I can recall club members have ask to shared their digital media with the club at the regular meeting or during social observing nights. Many of items are photographs they have taken; a few are documents they have discovered on the Internet. Usually the photographs are on a directory of a USB memory stick, which are displayed with one of the Imaging software program on the observatory computer. I have seen many great photographs presented in this fashion. It was not always a good presentation method. A better way would have been by using digital slide show software. By using one of these programs text information could have been added to the slide and the photos could be shared with all of the members during the meetings. The software Impress, part of the Open Office suite of programs, is a free slide show program that is a well suited this purpose. For my slide shows I use an old version of Microsoft PowerPoint, which is not free and very expensive. As with any software learning how to use it takes time. Often the supplied Tutorials are long-winded, and sometimes hard to follow. I find the HELP functions often are more insightful. Remember now that I have spend a lot of my working years in the Information Technology field, reading many software manuals and documenting procedures for “In House” developed software. I realized how much of a task it could be to learn new software. I have often seen software documentation focus on minor details and impressive features, while burying basic features inside the manual. To that end I have documented the steps to guide the user in creating a basic slide show. Assuming the user knows what a toolbar is and drop down menus are and how to navigate using a mouse. This is all covered in one or two page document. Not all of the step procedure I write will make sense to everyone. Need more information, search the software Help files for details. So here they are for you to download and follow. First you must download and install the Open Office software suite for the Impress slide show from this web page. http://www.openoffice.org/ You can use the custom install to load only the Impress on your computer or load all of the programs. Now if you really get the hang of this and share your photos at the club meetings, you can use you newfound skills by making any number of different informative presentations. One such example is the Konstellation Klouseup show, that former President Joe Kamichitus many years ago. An informative slide show of the deep sky objects of interest in a Constellation that can be observed with a telescope from your backyard. Need reference material to create a Konstellation Kloseup show? Well you’re in luck, for the club’s library is stocked with many observing books well suited for this. Download this list of books in the library and other resource available online. As I have stated many times, I like looking over printed charts of the sky and maps of the worlds of our Solar System. However, not all maps can be used at the telescope. Moisture from dew, which can damage a chart, a windy night, or just plain cold weather can make their use cumbersome at the telescope. Laminated charts are great at keep dew from destroying charts. Some of you may recall my slide show program review of three downloadable PDF charts. There a number of free star atlas available online for download. Printing selected PDF charts or from software such as Guide or AstroPlanner has some advantages. The paper charts fits easily on a clipboard; one can mark it up with notes, and if dewdrops do fall and make a mess of the chart one can simple print another. I prefer to use a tape or digital recorder for making notes at the eyepiece. Another handy item I use in the field are the 3 x 5 inch AstroCards. They can be stored in a small index card box, or as I have done with my sets, insert them into a 4 x 6 inch photo books. If you enjoy browsing through a hardcopy atlas, then there are many to choose from. The Sky Atlas 2000 is a very popular and oversized set of charts. It also comes in a laminated version for use at the scope. When I am in need of a closer view of an object of interest then I use Uranometria or one of my software charting programs. Most of the time a printout from software works fine for my purpose at the eyepiece in the field when used with my Sky Atlas 2000. On occasion I do use one of the 571 Type C Tri Atlas PDF charts instead of a software-generated charts. These are 8.5 x 11 portrait orientated charts of the sky that can be downloaded for free from www.uv.es/jrtorres/triatlas.html website. Check out the other Type A and Type B charts also available at no cost. www.astro-forum.org/Forum/index.php?showtopic=30784. This is not something to carry around in the field. So that is why each one of the pages can be removed from the Atlas and placed in a protective sleeve. In a price range of some planetarium software packages this atlas is billed as “the world’s largest printed atlas of the entire sky, available on the market”. Less than the price of the no longer available DeskTop Universe software. If this sound like a must have for your library then direct your web browser at www.greatskyatlas.com. To identify lunar features I use my copy of Rulk’s Atlas of the Moon. The book is not laminated so I prefer not to use it in the field on nights of high humidity. The book is out of print at this time, new observers do have other sources to use when observing the Moon. One that I have just become aware of is the Lunar Field Atlas CI. A large and free PDF file, on the same layout order as Rukl’s Atlas of the Moon, the Lunar Field Atlas CI is by Frederick C. Dase. Lunar Field Atlas covers the lunar surface with 38 separate charts, each from the digitized photographs of the Consolidated Lunar Atlas. Get yourself a copy from the website www.astronomylogs.com/index.html. The website on the moon by Charles Wood, lpod.wikispaces.com, is a rich source of detail information on many of the well known and lesser known lunar terrain. These are some of the many fine charts and atlas available now. The annual event that uses the bright stars of the constellation of Orion to estimate regional brightness levels of the sky at night will get underway again in March 2010. Starting on March 3 and continuing to March 16 you have the opportunity to get involved in this worldwide program. All the information need to participate is online on their web site of the Globe at Night. The program is based upon limiting magnitude, the faintest star that one can see with one’s eye, without optical aid. No special equipment is require, i.e. binoculars or a telescope, just your own eyes. The stars used in the program are those of the constellation of Orion. Orion is one of the most familiar and easily recognized star patterns in the sky. The other patterns are the stars of the Big Dipper; still not a constellation, and of course the often mistaken for a constellation The Pleiades; still not the Little Dipper. I’ll let you figure that out. Using charts of Orion downloaded from the Globe at Night web site, participants determine the faintest star one can see with their eye. This along with your longitude and latitude is submitted to the Globe at Night program using an online form or paper form if you wish. The web site has instructions on how you can get the longitude and latitude of you location from online sources or your own personal GPS device. Of the two web sites mentioned on the Globe at Night web site the ItouchMap web site was easier to use. Use the drop down menu in the upper left to select the Lat – Long menu. You then enter your home address to display your Latitude and Longitude in both degrees minutes and seconds and in decimal degrees. Not to complicated is it? I have been participation in the program for a number of years, as have other members of the club. Ok so you’ll need a red light and warm clothing and a good view of the sky where Orion is. And a chair, that’ s all you need. And a computer. I’ll assume since your reading this you have one. But that’s all, really. One last thing, clear skies. A eye patch, one that you may have left over from Talk Like a Pirate Day, is not required. My main objective of the night was imaging various Messier Objects with the RC-20, a project of one of the Astronomy Class students. A thin layer of clouds turned the sky to grayish color. Only the brighter stars of Orion and stars of the other constellations made their way through the clouds. No chance getting acceptable photos of galaxies and planetary nebula on the schedule tonight. However this made Mars a prime visual observing target with the Clark Refractor. Having missed out looking at the planet with telescopes because of the long periods of overcast skies and single digit temps, this would be a chance to get a look at the planet. Even with the small halo around the planet, seeing conditions were over all very good. Better views as the planet climbed higher. By the time I arrived most of the 15 or so Astronomy Class students had already taken a look through the eyepiece. When it was my turn at the eyepiece the view was not good at all, slightly out of focus and over magnified for the seeing conditions at the time. A 21mm plossel improved the view considerably. The seeing settled down and the edges of the planet were sharp. The right angle diagonal was removed, so I could view it straight through the scope. I prefer this setup over the other. The NPC stood out as a very bright white easy target, bordered by a darker collar surface. Above the NPC and rotating into view Mare Acidalium was an easy dusty region. Further south a bright white feature hugging the limb. Half the size of the NPC it was the second brightest feature seen tonight. I have never seen a bright marking as this before close to the equatorial region of Mars, I assumed it to be a very bright morning cloud on the limb. It was surprising easy to see without the use of a filter. It was slightly brighter when viewed with blue and green filters. Near the CM, Sinus Sabaeus stretch across the southern hemisphere of Mars. Rotating out of view was Syrtis Major, marked only as a darker feature close to the limb. Seeing was acceptable when the magnification was increased with a 15 mm Panoptic eyepiece. Steady views more that unstable conditions. More of Sinus Sabawus was seen and the bright white clouds on the limb still an easy target. Overall I was very pleased with tonight’s first long awaited view of the 2010 opposition of Mars. The students enjoyed the view also their second time around. This web site has a photo closely matches the eyepiece view.